Found 250 blog entries for December 2012. Monday, December 31st, 2012 at 3:33pm. In 1959, Intermediate School 51 was built on Staten Island's North Shore. The Markham Intermediate School, as it is also known, was named for Edwin Markham, a California teacher and school principal. Markham became known to Staten Islanders after having published works of poetry and soon after moved to Staten Island. While residing on Staten Island, he lived nearby, in the neighborhood of Westerleigh. Monday, December 31st, 2012 at 2:53pm. on constructing a school on the site. 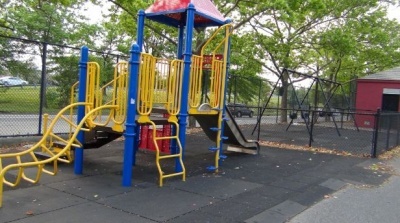 Three years passed and nothing had been done, so the site was transferred to the New York City Department of Parks and Recreation. By 1939, a playground had opened on the site. was killed during the First World War. Before enlisting in the United States Marine Corps, Mahoney lived on Staten Island in the neighborhood of New Brighton. At the dedication, Mahoney's eldest brother presented a plaque which was cast in honor of the fallen soldier. Monday, December 31st, 2012 at 1:02pm. In the middle of the nineteenth century, a large parcel of land on Staten Island's East Shore was purchased by the president of the Staten Island Savings Bank, Louis Henry Meyer. Upon this land, Meyer built his estate, which he named Fox Hill Villa. Many nearby places were soon named after his estate. In fact, the surrounding community was named Fox Hills. By the twentieth century, much of Fox Hills was made up of the Fox Hills Golf Course and the adjacent Fox Hills Base Hospital. Once these sites disappeared, the area began to be developed for residential use. In 1938, a small parcel of land there was acquired by the City of New York. 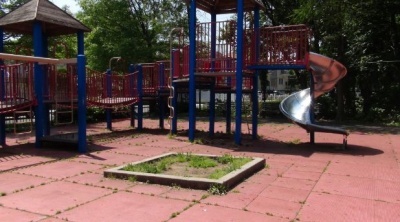 This site soon came to be known as Fox Hill Playground. Monday, December 31st, 2012 at 10:55am. 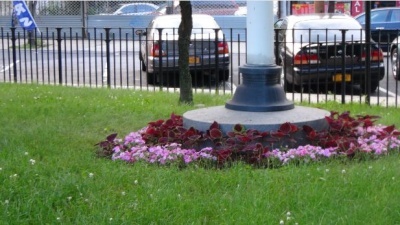 Staten Island is home to many green spaces which hold war memorials. In the northern section of the borough, you can find Egbert Triangle, named for one of the members of the Egbert family. The Egbert family first settled on Staten Island in the seventeenth century. Over the years, many of them became prominent members of Staten Island's society. In fact, there was even a neighborhood named after them near the center of Staten Island-Egbertville which is commonly referred to as New Dorp Heights. Monday, December 31st, 2012 at 10:51am. During the latter part of the nineteenth century, the neighborhood of Westerleigh was known as Prohibition Park. 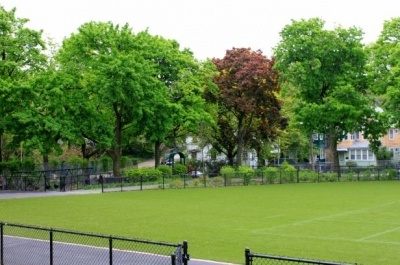 At the time, the site housed many recreational activities for members of the temperance movement, so it's no surprise that once the neighborhood began to be developed, a few parks were created. In the early part of the twentieth century, the National Prohibition Campground Association donated and sold several acres of land to the City of New York. In 1907, three acres of land were purchased by the city. 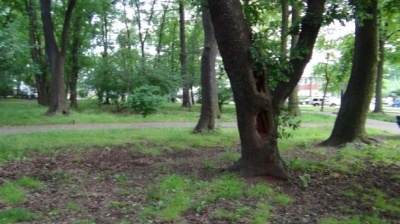 For over half of a century, nothing was done to the three acres of woodlands. Friday, December 28th, 2012 at 12:21pm. On 12/15/2004, a one-family home in the neighborhood of Todt Hill, Staten Island, 10304, was publicly recorded as transferred without money considerations. This home is at 40 Windy Hollow Way, which is located on block 898 and lot 118. It was built in 1950, on 10125 square feet of land and has a living space of 2160 square feet. Friday, December 28th, 2012 at 12:20pm. On 10/7/2004, a one-family home in the neighborhood of Todt Hill, Staten Island, 10304, was publicly recorded as sold for $940,000. This home is at 935 Todt Hill Road, which is located on block 894 and lot 559. It was built in 1950, on 9178 square feet of land and has a living space of 8892 square feet. On 1/30/2004, a one-family home in the neighborhood of Todt Hill, Staten Island, 10304, was publicly recorded as transferred without money considerations. This home is at 11 Utopia Court, which is located on block 871 and lot 165. It was built in 1997, on 10588 square feet of land and has a living space of 6768 square feet. Friday, December 28th, 2012 at 12:19pm. On 12/20/2004, a one-family home in the neighborhood of Todt Hill, Staten Island, 10304, was publicly recorded as transferred without money considerations. This home is at 647 Todt Hill Road, which is located on block 877 and lot 91. It was built in 1925, on 15806 square feet of land and has a living space of 3232 square feet. Friday, December 28th, 2012 at 12:18pm. On 8/16/2004, a one-family home in the neighborhood of Todt Hill, Staten Island, 10301, was publicly recorded as sold for $999,000. This home is at 28 Tiber Place, which is located on block 687 and lot 270. It was built in 1980, on 9765 square feet of land and has a living space of 3645 square feet.